As a young girl, I always found myself drawn to dark and ethereal stories. My parents would often get mad at me for frightening my younger family members with Ouija board games, makeshift séances and candlelit ghost stories. But let’s be honest, they kept coming back for more and no doubt found this unknown world to be as thrilling and mysterious as I did! Fast-forward twenty years and it is no wonder that I now seek out travel experiences with my own children with deep historical significance and a rich history of ghoulish tales. The funny thing is, if you do a Google search for “haunted places to visit with kids” (go ahead, try it; in a new tab, of course), you will find a bunch of articles about haunted houses that are apparently not too spooky for kids, and a suspicious lack of information for visiting actual haunted historical sites with children. What the heck is going on here!? I can’t be the only mom interested in sharing real-world ghost stories with my kids! Let me be clear, I don’t believe these places are actually haunted per se; but I do love a good, dark story and I do get enthralled by the emotional weight of tragic individual stories that DO seem to haunt certain places. The only other conclusion I can think to draw from this sparse research is that most moms simply don’t consider taking their kids to places like these, either because it seems inappropriate to them or they lose out to more conventional family attractions like theme parks or resorts. But honestly, I think these families are truly missing out. As long as children are prepared for haunted history, whatever that you think that means for your particular family, then your kids will start to feel comfortable and probably delight in places like these as much as mom does. Our personal style has been to embrace a rather uncensored style of family travel, purposefully choosing to expose our children to unfiltered experiences of cities, cultures, exhibits and events just about anywhere. If you follow us on social media you will know that ghost stories, voodoo museums, catacombs, prison ruins, torture chamber tours, and emotionally heavy exhibits have definitely not been out of bounds for us. In fact, I believe this appetite for unconventional family travel makes our blog a unique resource for other moms out there like me, which is the reason for our tagline “family travel with a twist”. 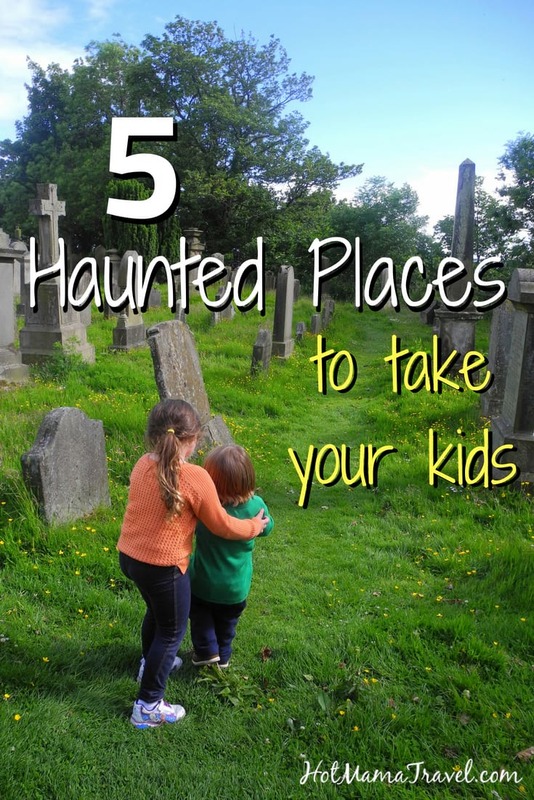 So, if you would like to inject a little mystery and ethereal excitement into your next family trip, consider visiting one of these FIVE haunted historical places with your kids (plus a bonus at the end of the article). 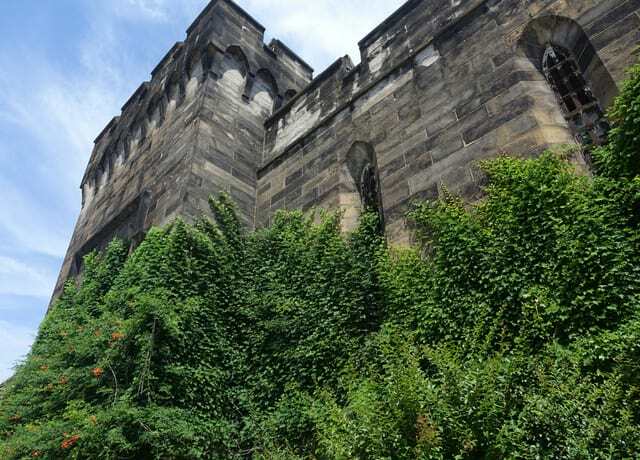 History: Eastern State Penitentiary is a historic landmark prison that was commissioned by the Pennsylvania legislature in 1821 to hold up to 250 inmates. It was the first of its kind “penitentiary” style prison that isolated prisoners in cells to inspire regret and penitence, a correctional theory (known as the Philadelphia System) that has played a foundational role in the design of our modern day prison system. By 1836 the prison complex was completed with state-of-the-art plumbing, sewage and central heat – all before the White House even had these things! Upon completion it was one of the most expensive buildings in America. In 1929, Chicago gangster Al Capone spent almost a year at Eastern State Penitentiary, which had grown to hold up to 1700 inmates. During the 1970s and 80s, the prison was permanently closed and abandoned, languishing as an urban jungle for stray cats and vandals for several decades. 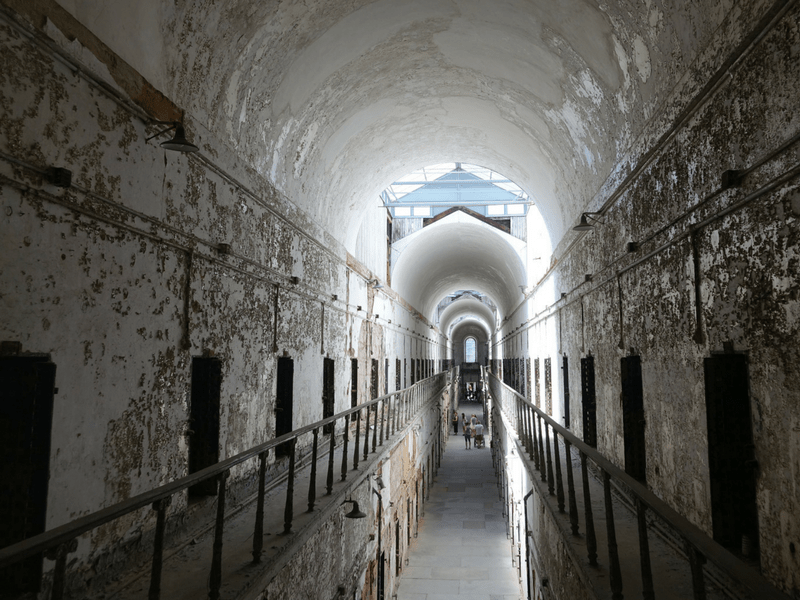 What to Expect: Fast forward to present and Eastern State Penitentiary is now a historic landmark that has been featured in several Hollywood movies over recent years. 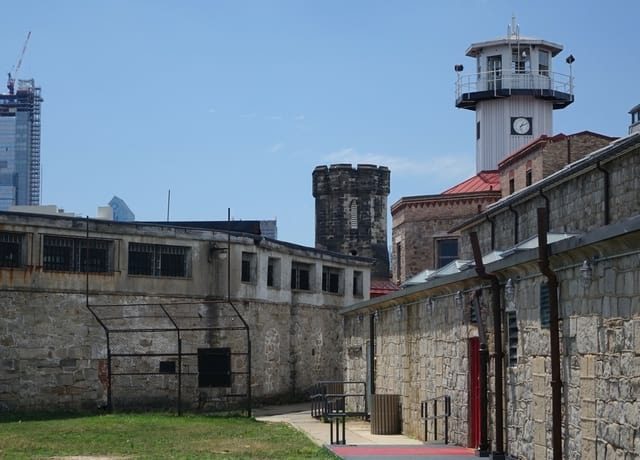 The outer walls of the prison emerge from the bustling streets of Philly like a medieval castle, beckoning families to explore the dilapidated prison blocks and bathe in the incredible stories contained within its stone walls. Visitors can tour the prison ruins, which is actually creepier and more eerie than even the photos can portray. They provide an educational audio tour called “Voices of Eastern State” which is entertaining and narrated by Steve Buscemi. You will learn about the history of prisons in America, and about the specific experience of prisoners at Eastern State during different time eras. Hearing these first-hand stories of prisoners while standing inside the ruined cell blocks will inspire a visceral feeling that this place may truly be haunted. Hot Tip: A great time to visit is during Halloween, as they host one of the most popular Halloween events in the country, called “Terror behind the walls”. Learn more on their official website HERE. Why kids will love it: We visited Eastern State when our kids were 5 and 6 years old, and I think they really learned a lot from the experience. 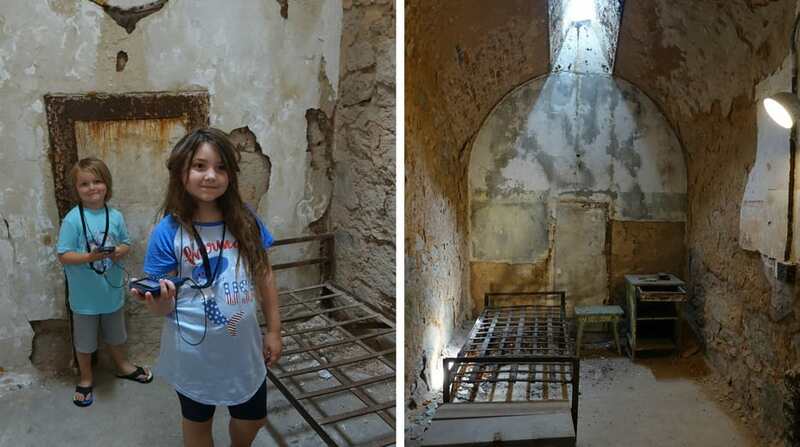 I mean, it is rare for children to be allowed inside of a functional prison to really appreciate and understand what it means when people “go to jail”, but visiting a ruined prison of historical significance is a safer and more interesting way for children to learn about the topic. In fact, it is likely your kids will not even learn much about this topic in school, nor will it come up in casual conversation around your dinner table, so I think it is a great educational opportunity for kids (heck, and for parents). 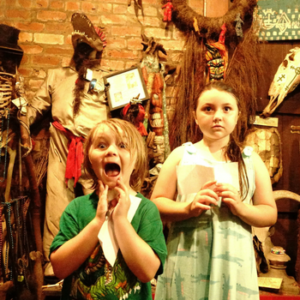 In fact, we found that our kids were pretty engaged with the audio tour, and were excited by the numerous amazing picture opportunities with the unusually creepy backdrop. I can almost guarantee that your kids have never been anywhere like Eastern State Penitentiary, and that alone (in my opinion) makes it worth a visit! Tours Available: Tours are available all year-round, seven days a week. Tickets can be purchased at the door or online (with a small discount), and the audio tour and history exhibits are all included in the admission price. Adult general admission is $14.00 and children (7 to 12) are $10.00. Children 6 and under are free, but we did have to sign a waiver due to environmental hazards that still exist in the ruined prison. With young children you are advised to be careful that the kids do not touch or climb on anything. Just keep a close eye on them and you will be fine. 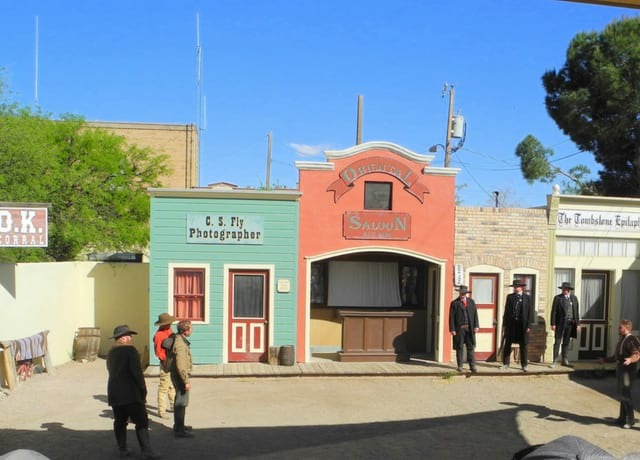 History: Tombstone is so much more than just a popular movie – it is a real place, with real history, that runs much deeper than just a gunfight at the OK corral. 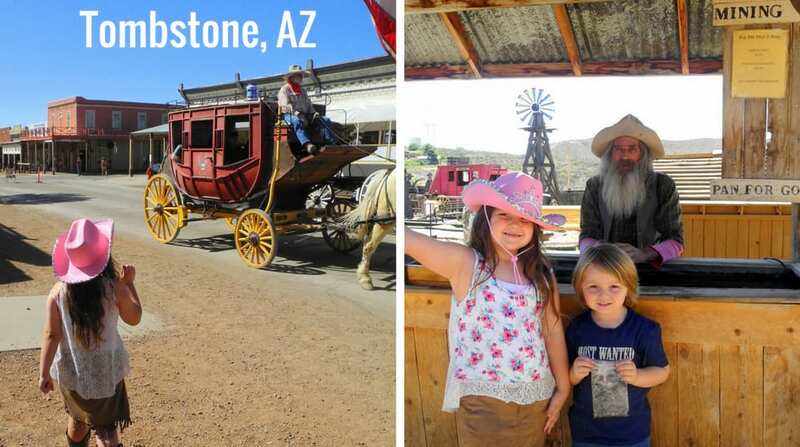 Located in Cochise County in southern Arizona about 35 miles from the US border, Tombstone was founded in 1879 by a silver prospector named Ed Shieffelin looking to strike it rich on the American frontier. And strike it rich he did! Through the 1880s, the mines in Tombstone produced almost 100 million in Silver bullion, and the city grew to a population over ten thousand in just a matter of years. At its peak, the city of Tombstone sported 110 saloons, 14 gambling halls, numerous dance halls (and brothels), four churches, two banks and one school. However, Tombstone also suffered from several devastating fires over the years that destroyed large sections of the city. 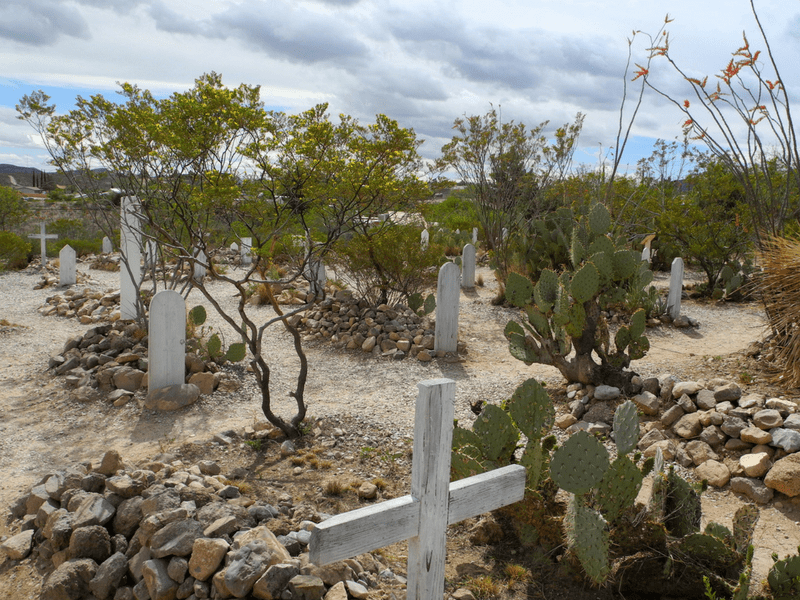 Due to its lawless, violent and fiery history, Tombstone is generally regarded as one of the most haunted places in Arizona, if not the entire West Coast. What to Expect: Now a National Historic Landmark, there are so many historical buildings and amazing things to see in Tombstone AZ, including the Crystal Palace Saloon, Longhorn Restaurant, Cochise County Courthouse (with gallows still in the courtyard), City Hall, Big Nose Kate’s Saloon (one of our absolute favorites with free live music and festive cowboy atmosphere), Boothill Graveyard, and of course, the infamous Bird Cage Theatre. 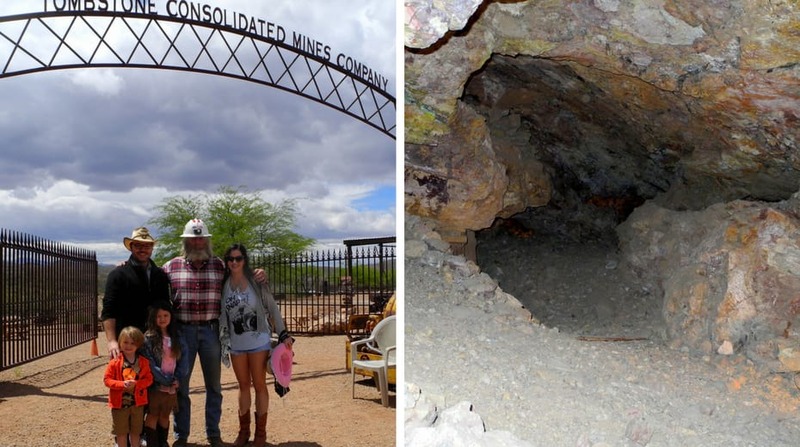 We spent a long weekend in Tombstone and we were able to virtually do it ALL, including a tour of Shieffelin’s mine guided by a charming local miner and a guided ghost tour in which we walked the city with the kids at night hearing all the creepy ghost stories. It is a small city but it is literally cram-packed with fun things to do with kids, including seeing the world’s largest rose bush, a dramatic recreation of the gunfight at the OK corral, shopping authentic country western stores, and touring the Bird Cage Theatre, which is still adorned with bullet holes and old west regalia. Why kids will love it: Seriously, what is not to love about Tombstone? 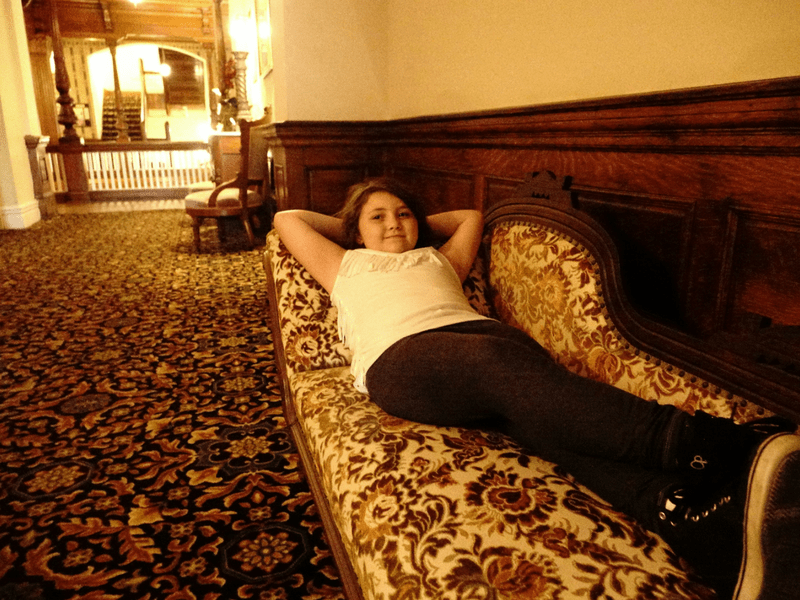 The kids really enjoyed the hotel we stayed at called the Tombstone Grand Hotel because they had a bonfire at night with a local artist who played guitar and prize games with all the kids. Honestly, I’d like to say that the kids enjoyed the ghost tour, but because it was at night, my 4 year old son fell asleep and my daughter was getting restless by the end. We had a lot of fun on the tour though, and learned some interesting information about the history of Tombstone. The kids also really enjoyed exploring the Shieffelin’s mine because it was their first time going 100 feet underground (go figure!) and it was a totally unique experience. We capped off each night with live music and dancing with the kids, and of course a couple of pints, at Big Nose Kate’s Saloon. Crystal Palace also had good food for dinner and free live music that we all enjoyed. Actually, recalling all these fantastic family memories makes me want to go back tomorrow! Tours Available: There are so many different tours available that are worth your time and money, from our experience. 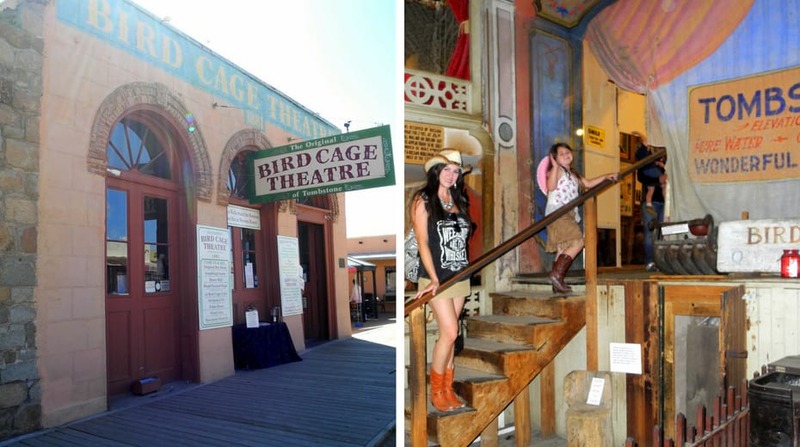 I would definitely check out the daily self guided Bird Cage Theatre Tour (Adults $12, Kids 8-18y $10) and if you have older kids (12 and up), I would recommend the Bird Cage Ghost Tour ($20 person). There are various other ghost tours offered by different companies that you can read about online and check reviews. I would also recommend setting aside two hours to do the Good Enough Underground Mine Tour as long as your kids are at least 4 feet tall and your family is willing to walk lots of stairs (Adults $15). The OK Corral is a must see, and you should definitely try to catch an afternoon show (remember to wear sunblock!) where they do a dramatic recreation of the epic gunfight (Adults $10, kids 5 and under FREE). You can even score some impressive pictures with Doc, Wyatt, Virgil and Morgan! Honestly, the kids were a little less interested in the museum tour of the Tombstone courthouse (at least they were both under 6 and FREE), but the adults enjoyed killing a few hours there learning more about Tombstone’s history (Adults $7). 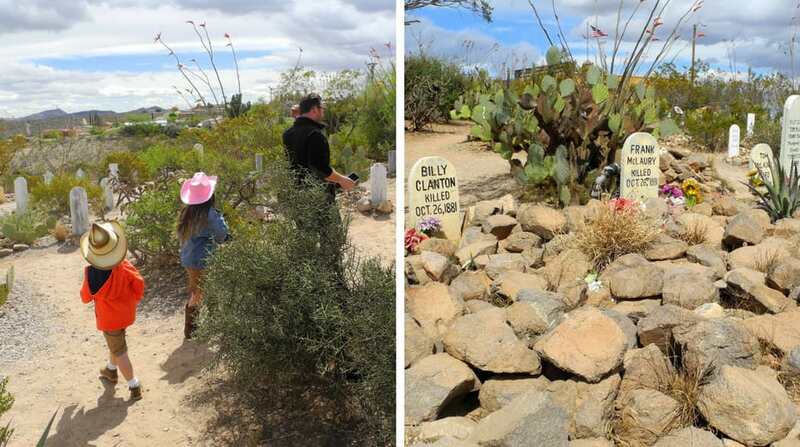 For free, you absolutely have to do a self-guided tour of Boothill Graveyard to see the real graves of notorious Tombstone residents like Marshal Fred White, Billy Clanton and the McLaury brothers. Also for free you should just walk around the city and visit places like the original home of Wyatt Earp and his brother Virgil (now a cute bed and breakfast). History: According to many, including our own Government’s Commerce Department, the Whaley house is an official haunted house. Travel Channel’s “America’s Most Haunted” even went so far as to say that Whaley house is the MOST haunted house in America. The Whaley house, as the name implies, is the historic family home of the Whaley family built in 1857 by Thomas Whaley. In the early years it stood at the center of public life in San Diego, housing the County Court house and the first commercial theater in San Diego, while also serving as a polling place, school, billiard hall and ballroom. Before the house was constructed, this was the location of gallows where convicts like “Yankee Jim” (now a reported ghost that roams the property) were hanged from the back of wagons. In 1882, Thomas Whaley’s daughter Violet Eloise married a con artist who disappeared during their honeymoon with the substantial dowry, and she was shunned from Victorian Society thereafter. Tragically in 1885, at the age of 22, Violet committed a violent act of suicide by shooting herself in the chest with a .32 calibre. Her ghost is just one of the many purported to inhabit the confines of the Whaley house today. 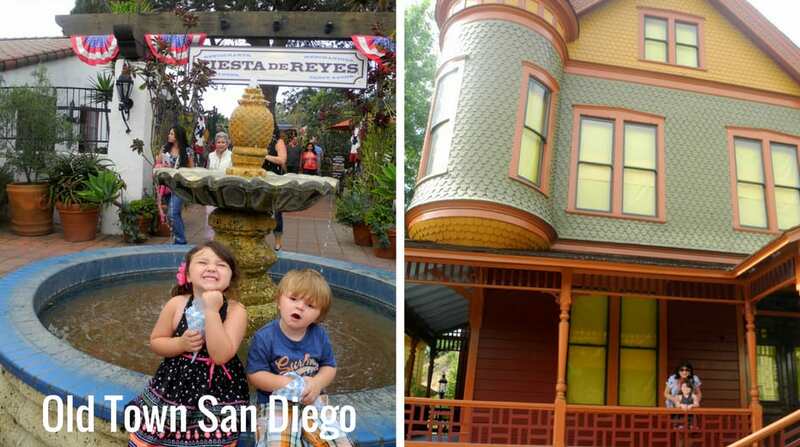 What to Expect: The Whaley house is said to be haunted, sure, but don’t let that scare you from visiting this vibrant Old Town district in the heart of San Diego, CA. We have traveled the country and this is still one of our all-time favorite places to visit, and living in Orange County, we do visit regularly. 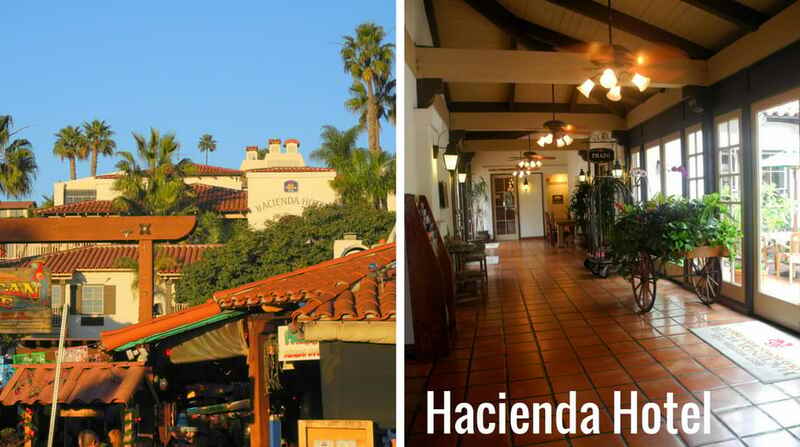 If you plan a visit, do yourself a favor and book a room at the Best Western Plus Hacienda Hotel – this is our go-to place to stay in Old Town and it is literally steps away from the Whaley house. The Whaley house is a fun attraction, but the Old Town district itself is alluring enough with numerous authentic Mexican cantinas with mariachi bands and fresh tortillas, festive shopping areas for candy and Mexican-style souvenirs, historic graveyards and buildings, and a beautiful park where the kids enjoy running around being kids. Why kids will love it: Our kids love spending the weekend in Old Town San Diego. There is a fun candy store, a place to dip their own creative candles, lots of fun shops with cheap Mexican trinkets, a big grassy area to burn some energy, and every restaurant has free chips and salsa! 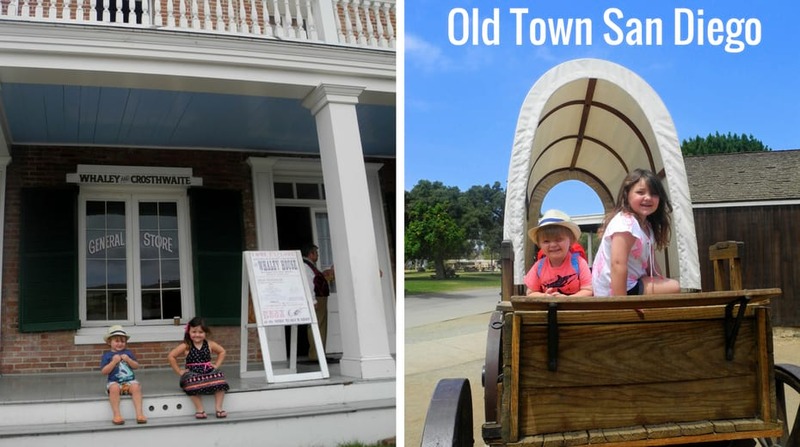 Kids are allowed to tour the Whaley house, and my kids seemed to have fun hearing the stories and seeing the old bedrooms and the courthouse that they still have on the second floor. We looked for orbs in the pictures at dinner afterward and toured the El Campo Santo cemetery with a ghost communicator app on my phone. It was great fun. 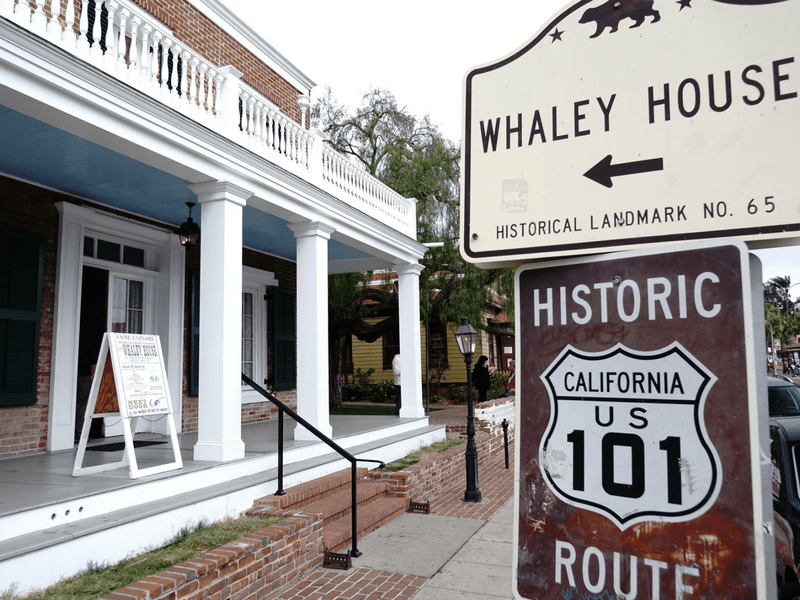 Tours Available: There are daytime and nighttime tours of the Whaley house. From 10am to 4:30pm, you can drop in anytime for a self guided tour (Adults $10, children 6-12 $8, children 5 and under are FREE). While children under 5 are not recommended on the night tour and we have never done it, it does sound like a unique and spooky experience. There is also a popular nighttime trolley tour to all the haunted sites in Old Town called Ghosts and Gravestones that you could also check out HERE. 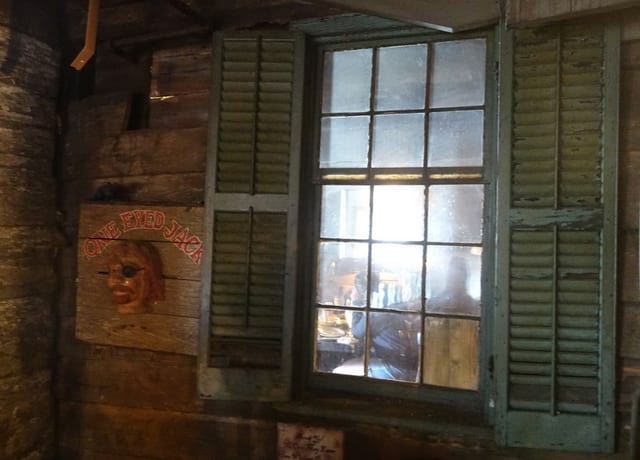 History: Talk about historic, the Pirates’ House is a tavern and restaurant in Savannah, GA established in 1753. Yes, you read that right, before the Declaration of Independence was even signed. In fact, a portion of the structure called the “Herb House” was actually built in 1734 and is reportedly the oldest building in Georgia still standing today. There is an old Rum Cellar in the basement of Pirates’ House, and there is an old tunnel from the 1700s that runs all the way to River Street. Savannah is regarded as one of the most haunted cities in America, and over the years, numerous ghost stories have accumulated about the Pirates’ House, including one of my favorites that the infamous Captain Flint from Robert Louis Stevenson’s novel “Treasure Island” actually died in the bedroom upstairs. 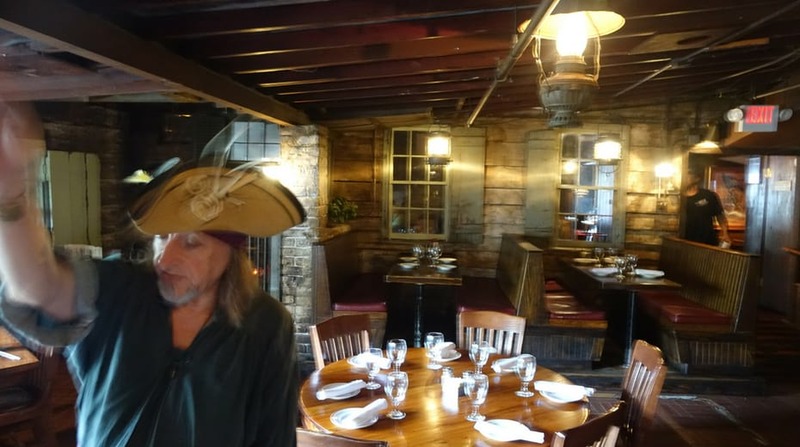 A building that has long been a refuge and meeting place for debaucherous pirates, drunken sailors, criminals and other unsavory characters, there is little doubt that this old tavern is full of spirits. 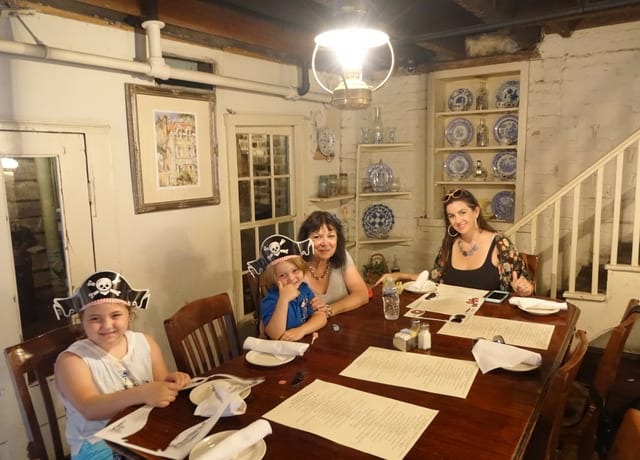 What to Expect: Fast forward to today and the Pirates’ House is now an immense restaurant that has incorporated adjacent buildings and grown since the 1950s to include 15 different dining room areas, each with its own style and charm. The tunnel still runs under the restaurant to the cellar (you obviously can’t go down there as the tunnel is over 200 years old), but there is a large opening in the middle of the restaurant so you can see a portion of the original tunnel. The food was excellent and included a buffet of delicious fried chicken, biscuits, potatoes and gravy, collared greens and other southern fixin’s. After dinner we talked to the hostess and found out that they give FREE pirate-guided tours from pirates that have deep knowledge of the history of the area. Since we were a party of 6, it was a basically a private tour and we just tipped generously at the end of the 30 minute tour. 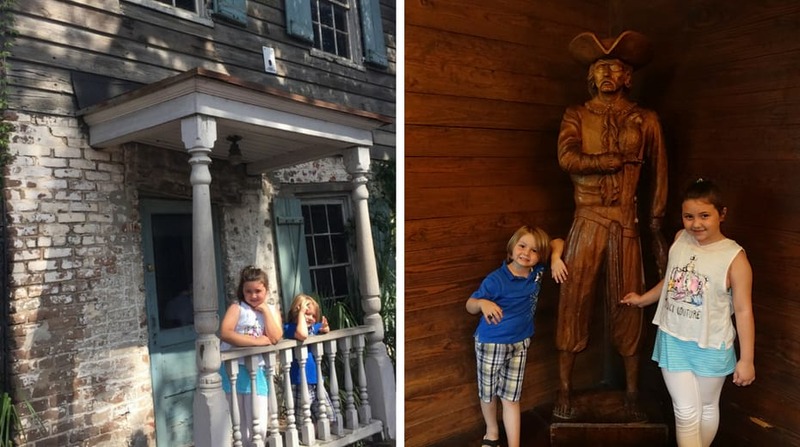 We learned all about the tunnel, the Herb House, the rum cellar, the book Treasure Island, and other interesting historical tidbits that make this restaurant truly unique and worth a visit with kids. 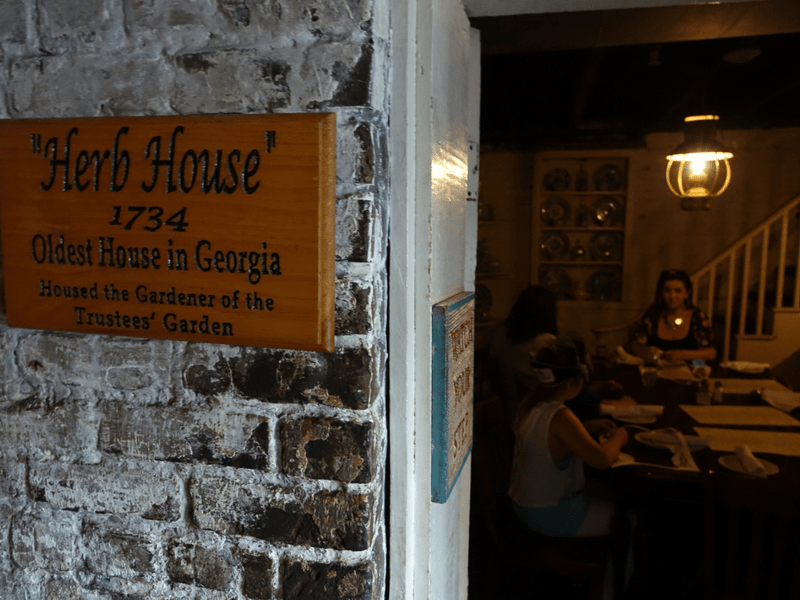 Why kids will love it: When we visited, we were so lucky to get the chance to dine as a family in the Herb House, literally the oldest standing structure in the whole state of Georgia! I let the kids use my handy ghost communicator app on my phone after dinner and they had fun talking to the ghosts (see in our video below). The kids always love buffet-style meals, so the food in this place really hit the spot. They enjoyed the pirate tour and listened thoughtfully the entire time, even asking some interesting questions, so I know they were learning a lot. They have a huge gift shop with tons of pirate-themed treasures and souvenirs, and the kids had a blast shopping at the end of our visit. This was probably their favorite restaurant experience of the entire summer, in which we visited dozens of cities in 19 states across 60 straight days of travel (You can read more about our epic US road trip HERE). 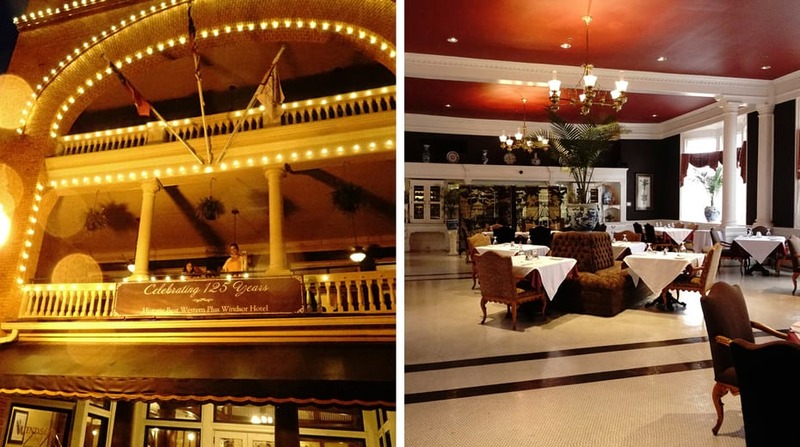 Tours Available: The restaurant itself offers a FREE guided tour that lasts about 30 minutes to learn about the history of the restaurant and the city of Savannah (we tipped $20 for our group of 5). There are also companies like Ghost City Tours that provide a variety of ghost tours of Savannah, which often include a stop at the Pirates’ House as well as the several haunted mansions, cemeteries, battlefields and burial grounds in Savannah, GA.
History: The Queen Mary was built in 1936 during the Great Depression by John Brown & Co in Clydebank near Glasgow, Scotland and is nearly twice the size in weight compared to its sister ship, the Titanic. While the Titanic never made it successfully across the Atlantic, Queen Mary completed 1,000 trans-Atlantic voyages. During WWII the Queen Mary was changed into a troop ship that was so fast and good at outrunning German U-boats that she earned the nickname “Grey Ghost”. After surviving the war, Queen Mary returned to passenger service as an ocean cruise liner for 20 years before retiring permanently to the port in Long Beach, CA in 1967. During her time in service countless prisoners of war, soldiers and crew died in her boughs and are said to haunt and roam the ship in its final resting place. In the past 60 years, there are also reports of two engineers being crushed by watertight “Door number 13” during routine drills. As a result, Queen Mary is said to be one of the most haunted places in the entire world. 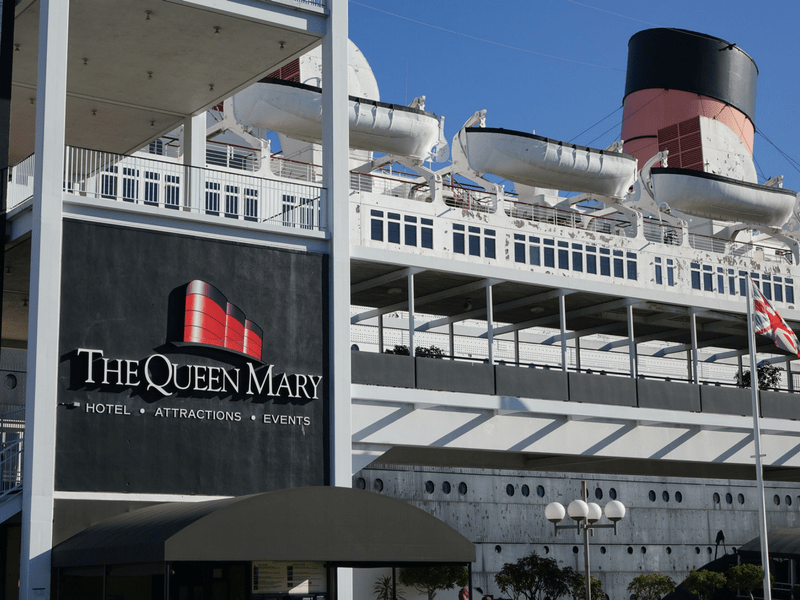 What to Expect: Today the Queen Mary is listed on the National Register of Historic Places, and is a fantastic place to visit for the day or even overnight, as the ship is still maintained as a fully functioning hotel. The state rooms are unique and maintain the retro Art Deco vibe of its time. 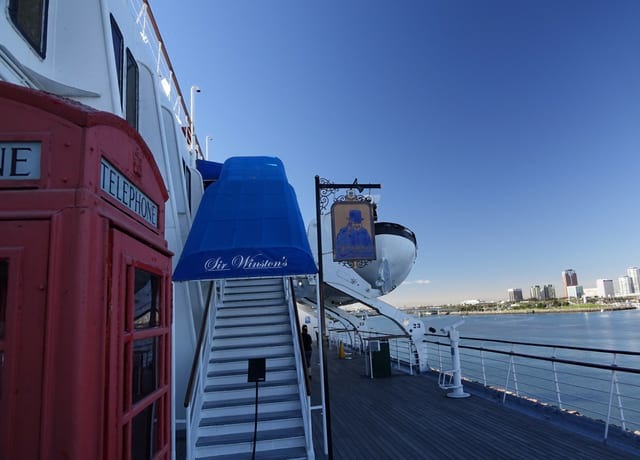 Still onboard the ship, you will find 3 casual and fine dining restaurants and one absolutely fantastic bar called the Observation Bar, which has scenic views of the Harbor and downtown Long Beach. Oh, and they have an epic Sunday Brunch in the elegant Grand Salon that Conde Nast Traveler named as the best hotel brunch in the world! They have various tours and rotating exhibits as well as fun events and festivals during different times of the year. For example, in February they host a raucous celebration of Scottish culture at the Annual Scots Festival and in October they host a Halloween event called Dark Harbor that has haunted houses, live music, dancing, and a whole lot of spooks. 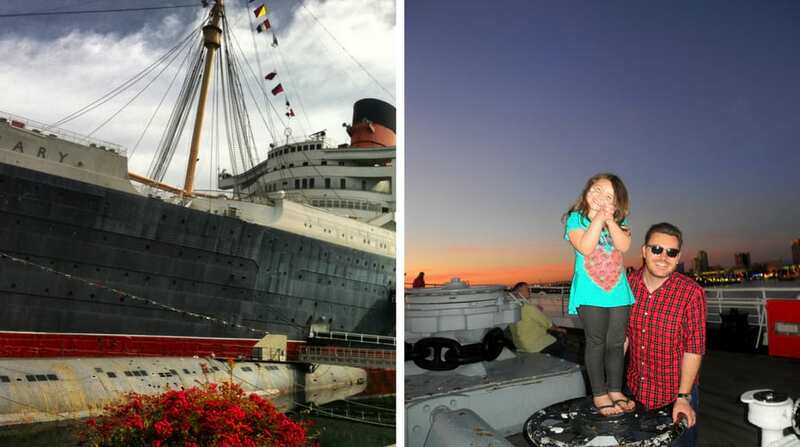 Why kids will love it: The Queen Mary has a lot of fun and informational activities for parents and kids. While their exhibits do occasionally rotate, that last time we went there was an enormous replica of the Queen Mary made from Lego blocks, and a section where kids could play with Legos. Currently (as of June 2018), the ship has an exhibit about life on the ship during WWII and its glorious time in service to the war effort, an exhibit on Winston Churchill who made frequent trans-Atlantic trips aboard the Queen Mary, an exquisite exhibit dedicated to the life of Princess Diana, and of course a Haunted Encounters tour and Ghosts and Legends tour that will take you to the dark bowels of the ship including the infamous old boiler room. There also fun free things to do while exploring the ship, with old images and artifacts virtually around every corner. Tours Available: General admission to board Queen Mary is $32 per adult, $25 for children 4-11 years. For $48 you can purchase a passport to most exhibits aboard the ship including the 4-D screening, Glory Days (WWII) tour, Haunted encounters, Princess Diana exhibit, Historic Exhibit, the ship model gallery and passion for painting. 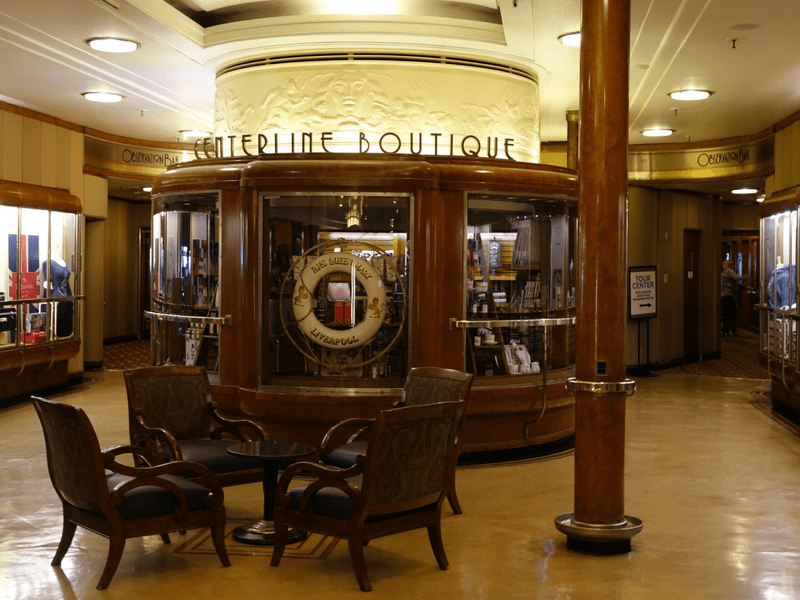 You can board the Queen Mary if you buy one of these tours OR if you are a hotel guest (a great value! ), or if you have a restaurant reservation. Find out more information and buy tickets HERE. Money saving tip: After 6:00pm you can board the Queen Mary for FREE and dine at one of the restaurants or hang out in my favorite place, the Observation Bar. If you spend $20 in these spots (you will), then your self-parking will be validated as FREE as well! History: The five-story Windsor Hotel was built in Americus, GA in 1892 and has 100 Victorian style rooms. Architecturally, this hotel is an absolute beauty with a tower, turret, several balconies and a three story open atrium. There have been numerous former Presidents and famous guests at Windsor Hotel over the years, but it is the persistent guests that really intrigued us during our visit. There have been numerous stories and purported sightings of ghosts including the old housekeeper and her daughter who died tragically (and were possibly murdered) in an elevator shaft on site, and the former employee named Floyd who spent 40 years of his life as a doorman and lift operator at the hotel. What to Expect: Victorian splendor. Wonderful food at the restaurant on site called Rosemary and Thyme. Killer drinks at Floyd’s pub. Possibly an experience of a ghost or two! (see the video of our family ghost hunting at Windsor below). Why kids will love it: Just watch the video below. There are so many ways in which travel can teach your kids about the world. We are big proponents in investing in family travel to supplement our kids education and to encourage family bonding. We have had incredible fun visiting these five haunted historical sites, and I think you will too! 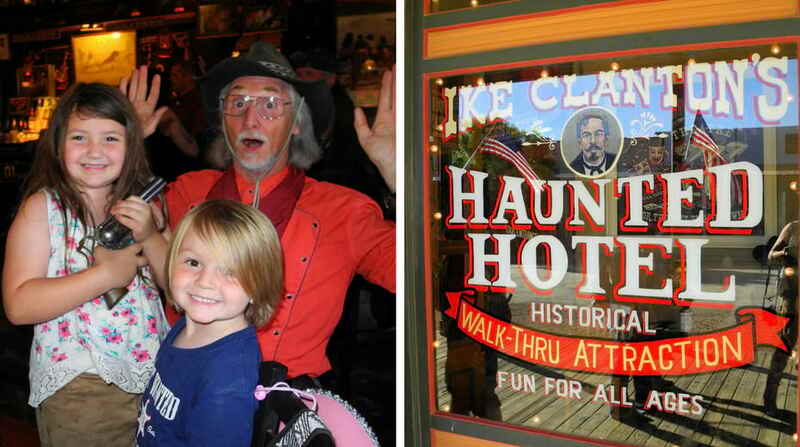 If you have found family travel to theme parks and resorts to be unfulfilling, try expanding your horizons and consider going on a ghost hunt with your kids in a haunted historical site. My kids love it and I am sure yours will too. Oh yeah, it definitely adds some excitement and it amazing how much history they’ll remember thanks to the ghost stories. yeah I’m a big fraydey cat! I could NEVER go into one of these places! I’m a wuss, although my kids might love all this stuff! Haha oh Harmony, I’ll go with you and we can have a beer afterwards. Yes do it. It was a very interesting place. What a great way to make learning about history memorable. My kids love ghost stories but they are definitely too young to actually go to places yet that are haunted. We tried and they wouldn’t go in the door! Hahahaha. Will refer to this list when they are ready for sure. Haha,my kids get spooked, but enjoy the tours. My husband and I don’t act scared so I think that helps. I’m not a big fan of things that are scary, but I love all the history you’ve included here and also the wide array of places across the US. Definitely saving for later. The history is the main reason we seek these places out, but the ghost stories just get the blood flowing. Well maybe I am just a big kid but I love all these places. Whenever I travel I look for historic places. While I have stayed in a few haunted hotels I have never seen or heard anything. I would love to visit Eastern State, who knows maybe the spirits will reveal themselves. I LOVE historical places too and although we have never seen anything either, the ghost stories just add a little excitement. 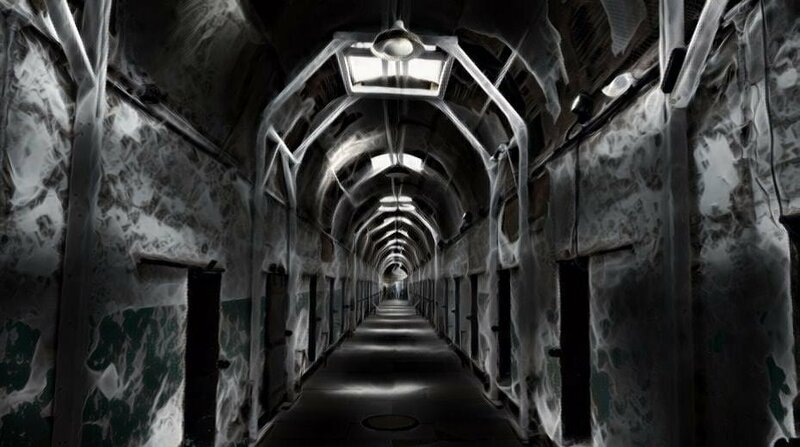 I am really not great with spooky anything – however the Eastern State Penitentiary looks so interesting and would love to visit and listen to the “Voices of Eastern State” to learn about the prison back then. With it being educational and fun, and not too ‘haunted’ would be ideal! I don’t believe in ghosts, but I’m still scared of them. Don’t know what kind of logic that is. I think kids that can handle this kind of stuff with a sense of humour and adventure are amazing people. How did I get to 51 years old without figuring out why penitentiaries are so named? Thanks for the education. Great family days out, my boys would love some of these. Haha, thanks for the comment Alyson! We learned a lot of new information about the history and theory of prisons and correctional institutions. Very interesting and unique place to visit if you find yourself in Philly. What a great list of ideas! I like scary, but what I really like beyond that, is that each of these places can teach kids about an aspect of history too. Learning along with a little hair-raising spookiness! Yes, and the spookiness provides the excitement to help kids retain the historic information. What a fun post! The only one of these I’ve visited is the Queen Mary, but I definitely have a few new items for my bucket list. I never realized how into haunted places I was until I did an amazing tour of Sydney’s Quarantine Station! Tombstone seems especially cool based on your description. I dont believe in ghosts, never got scared of things I don’t see, but the history of these places are remarkable! 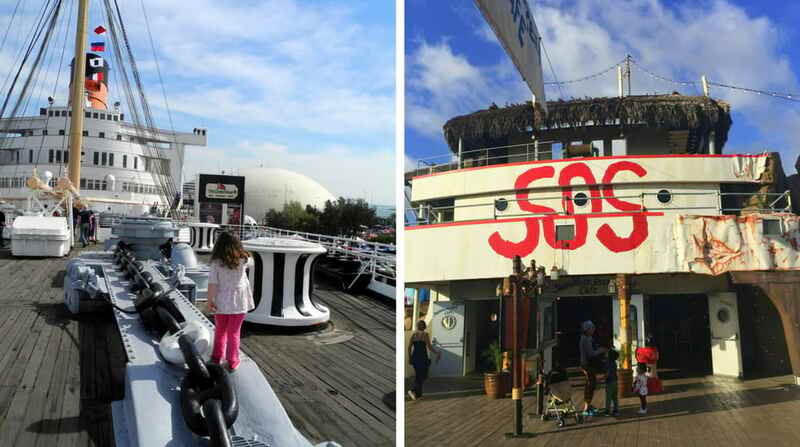 Queen Mary is my favorite in your list, and this place looks really pretty to be scary haha your kids are really adorable, by the way! I love the “real” factor too. In truth I love places with history and old places have a lot of stories. The spooky ones are always a little more fun. I am a geek when it comes to haunted places. I have heard the stories of Eastern State Penitentiary and Al Capone, as well as the iconic Queen Mary. But Windsor Hotel sounds like such an exciting tour to experience too! Yeah the Windsor hotel was a new one for us too. 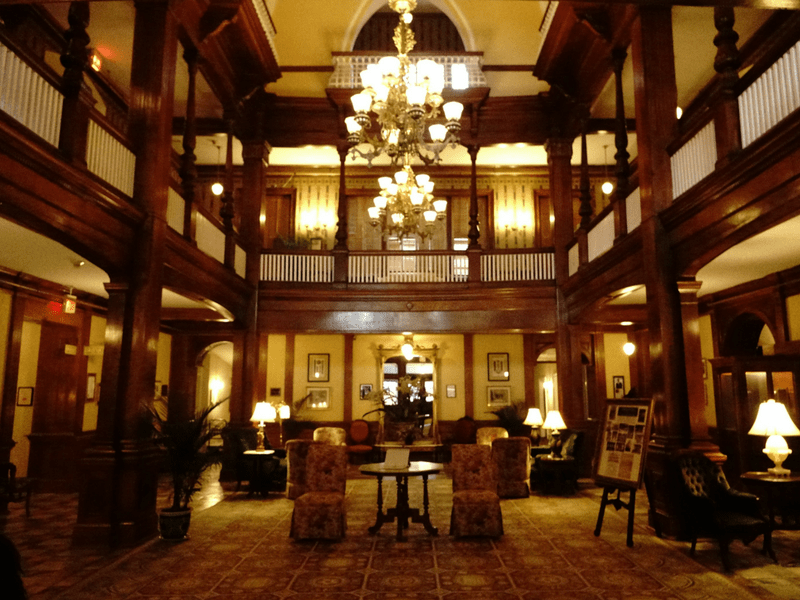 What I love about it is, that it is this beautiful and cozy historical hotel with a little added ghostly fun. These are such fun places to visit with kids! I really had no idea about them. It’s so cool that the prison is now a plae fo reducation and movie scenes. Yeah the prison was such an interesting place to visit. Since it was such a unique place, the kids really absorbed a lot of the information.